The recipe promised to bring men running. That sounded good to us. Not so much the men coming running bit, since Julia is happily married to an eminent Ancient Near Eastern scholar, and I’m still stupid for the flamenco guitarist. But anything that smells good enough to bring men running must by definition have something extra; some mysterious something contained within the 14 spices (plus lemon zest!) that touched the primal animal. It sounded promising indeed. So we printed it out and ventured into my spice box to see what I had on hand. It was when we saw how much space the spice and jar bottles took up on my table that we gave the recipe its new working name of Lamb with a Thousand Spices. Sure you can click above and see the original recipe, and you should. But I recreate it here for you. Because I love you. The measurements are strangely worded, because on Allrecipe.com you can change the portions and the ingredient measurements change accordingly. Brown half the lamb in 1 tablespoon of olive oil in a large, heavy-bottomed pan (we used the tagine). Remove to a plate and repeat with the remaining lamb. Add onions and carrots to the pot and cook for five minutes. Stir in the fresh garlic and ginger; continue cooking for five more minutes. Return the lamb to the pot and stir in the lemon zest, chicken broth, tomato paste and honey. Bring to a boil then reduce heat to low. Cover, and simmer for 1 1/2 hour to two hours (we did two and a half). You can thicken the broth if it’s too thin. promised, the men would eat more than their fair share. It marinated overnight. Already I was all tingly with the thrill of the unknown. The scent of danger. Me! Marinating! The next day, the day of the Seder itself, we started cooking at about 1 in the afternoon. I chopped and diced, trying hard to stay focused in the face of my growing panic that we’d started too late and that none of this was going to turn out anyway. 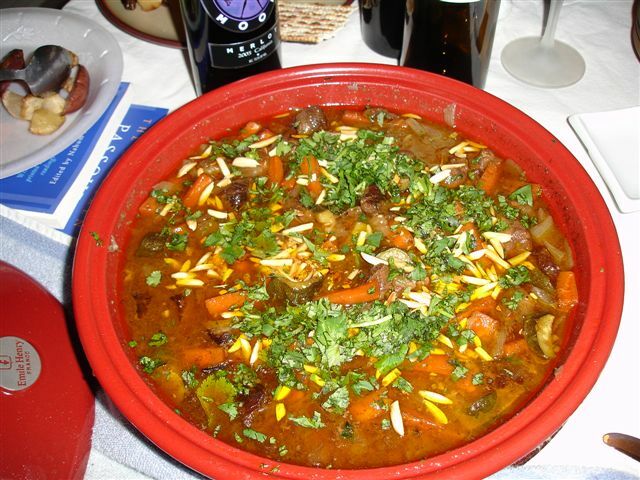 The first problem: We had too much lamb for the tagine. We had to split the portions between it and my dutch oven (or is it a soup pot? Who cares. It worked!). Before long, the lamb was bubbling away. Julia and I just smiled. The second man to show up was my friend E.J., who beat the traffic (and his wife, apparently, coming in a separate car,) to be the first arriving Seder guest. Over the course of its simmering, we noted that the lamb had a significant kick at the end. Maybe we’d put in a bit too much cayenne pepper? Julia suggested adding a lot more honey, which we did. I can’t tell you exactly how much. Two twirls around the perimeter with the bear. lot of traditional lamb tagines include prunes, apparently. And at the table she sprinkled it with freshly-chopped coriander. Did it taste as good as it smelled? I am happy to report that it did. 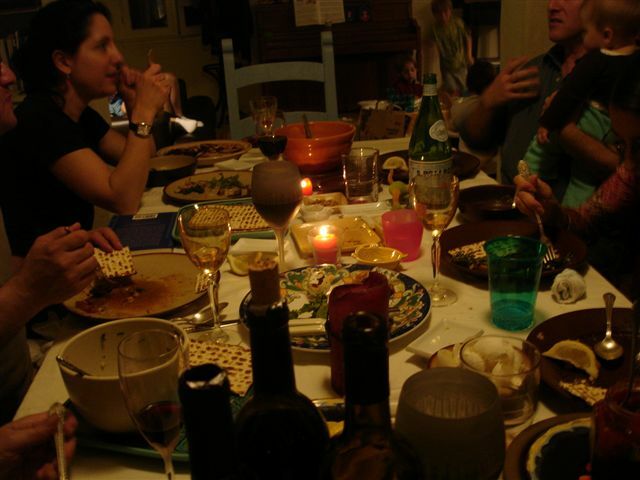 Even though I was running around mitigating the million little details that I had not attended to (like preparing the actual Seder part of the Seder dinner, for example), and serving things up and pouring wine, I finally sat down and tried a mouthful. The lamb dissolved in my mouth like butter. I could taste the honey, and the cardamom, too. There was still a nice little kick at the end. We served it with roasted heirloom potatoes and other vegetables. But oh, for some crusty bread to mop up those juices! Next time, I suppose. This dish paired great with the shiraz Tony brought and got raves from everyone who tried it. There were some leftovers, but not a lot: The males came through, each going back two or three times for more. In all, it was a vast improvement over my miserable failure two years ago. But that was a wholly different recipe, and of course, I didn’t have a tagine yet, either. Lamb with a Thousand Spices will be made again, and soon. Perhaps for a Spring party? Now if only I could say the Ruby Red Soup turned out as well. More on that next post. Stay tuned! Not only worth the wait, but worth a try! I’m in the process of planning a trip to the local Spice House (no big deal…it’s only ten minutes from home, but I’m trying to face my fear of spices) and this is quite motivating. It sure puts the bottled gefilte fish my mom serves to shame! This Spaniard came running in for sure. The lamb was exhilarating. It was the first time I’ve taken a bite of food that literally was an adventure in taste. The spices were in concert with one another, taking you on a lingual journey to a literal finale! (pant, pant)..whew! To say nothing of the beautiful B(ad)H(ome)C(ook)..! A magnificent celebration with wonderful people. Thank you for having me…AT. Maybe the flamenco guitarist will come running if you make this when he happens by your open window! I want to happen by to smell your kitchen…You’re going to need to make that again soon with all those spices in the cupboard. Hey – I opened my parenting to find your story today! Very nice! I liked it…darn good advice!